And by that, I mean, "the Kickstarter project that I spent so much money on is finally complete and I'll never spend that much again holy ****". That era. Kroze the Crowmaster now roams Eora somewhere. It is now up to me to find him, although my friends are already teasing me that they have. Backer NPCs are numerous and they share the herd mechanics of zombies in The Walking Dead, only exemplifying to the player what a weird, odd fantasy world this is. At every corner, you have creatures walking around town like it ain't no thing. I've attempted three runs so far, from Shortstack the Orlan Chanter onward. Always trying to find the perfect Main to RP. 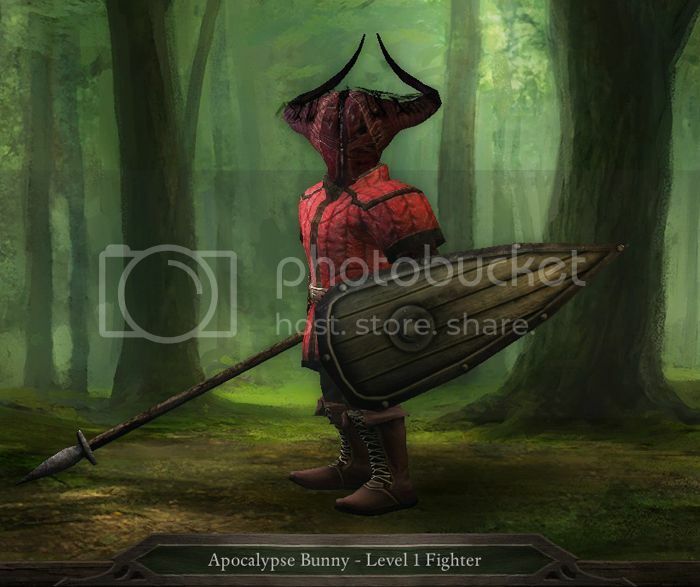 I finally settled on my Main as a stereotypical fighter since I couldn't make a War Vet background work with my Chanter. I also decided to model my Main after my friends LARP character, a post-apocalyptic soldier named Shiloh. I needed to sacrifice some points into INT for RP, but whatever. For this, I would need to possibly... go human. Shudder. Which brings me to my first real main criticism of the game: how conversational stat options are handled. For a game that lets you individually control each party member, and even lets you initiate conversation "as" that party member, this is rather sloppy. We're allowed to see what stats we need to hit in order to get certain dialogue options, and yet, only our Main is allowed to talk. If Obsidian wants to go the route of perma-locking dialogue options, at the very least flag the options so that they never, ever show up. Bringing me to Criticism #2. Backer NPCs are handled very interestingly. I'm not sure I 100% agree with Backer NPCs being little more than window dressing when Obsidian had the opportunity to very easily integrate Backer NPCs into the game at large (as the Backer Inns were), but using them as gameplay/narrative devices to allow you to play around with your newfound "Soul Powers" is extremely inventive as well as a non-invasive tutorial. Since the backer beta, combat has improved immensely. It could be that enemy mobs have been scaled back due to the kinks being worked out, but the Beastiary EXP system works great as well. Now, you get EXP from defeating foes, but only to a knowledge cap of their data. This system also acts as an incentive for combat. Don't worry, you won't be hitting the cap anytime soon. Progress is slow and particular. It still gets a little messy when you have seven party members beating up one dude, the micromanagement of abilities gets tricky, but enemies are friggin' tough. They are hard. If you are lax, you will find your guys going down more often than not. Aloth taught me that I need to make a custom Wizard with a bit more padding in the defense department. I also fear down the line for the EXP:Leveling ratio, but then again, I'm not even to the Stronghold yet. I was also pleasently surprised by the variety of enemies. I rather like the idea of "no bad builds". 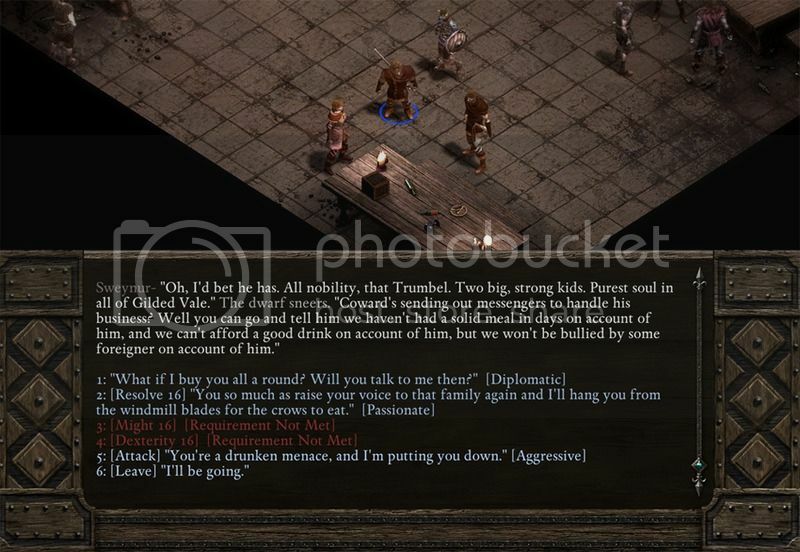 It was one of my main complaints about Icewind Dale, where a bad combo could stop you in the tracks faster than if you made the Pillars OT on NeoGAF and made the mistake of not mentioning the site's owner spent $3k getting their own portrait. 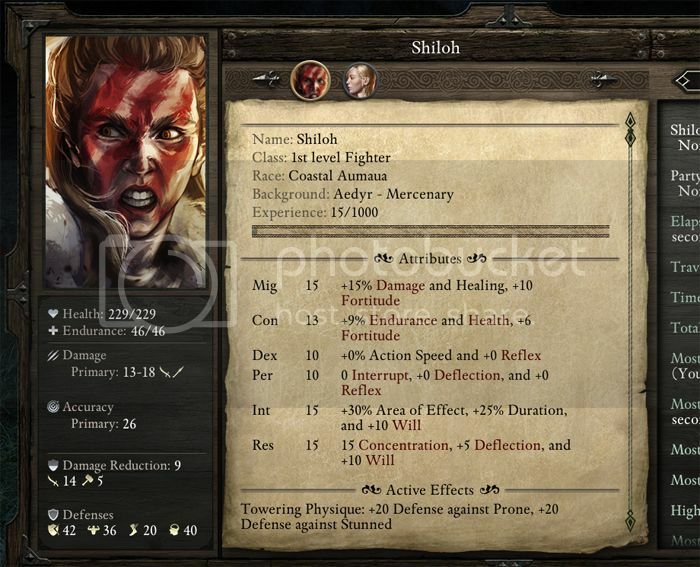 While the attributes at first may seem confusing (for instance, Might isn't called Strength because it is not the only stat that links to damage), the screen is full of percentages and descriptions that make every happy. It takes a while to make a "It's Saturday Night and we in the club, don't believe me just watch" build, but with the proper time, you'll be going GRRRRRRRRR to enemies who will be really scared. The party members themselves... well, the good news is that you can store them at local Inns and your Stronghold so that you can both build your own party as well as get all the nice gooey story bits with the pre-mades. Because, let's face it, the pre-made party members are all over the place stat-wise instead of specialized. As well, some classes are not even featured. I could go on for ages about the visual design of this game. It's just the right blend of Infinity Engine and modern touches. The Interstitchal scenes are all expertly drawn, given the same love and care as the rest of the game (there are also a LOT more than I expected with a LOT more reactivity than I expected). Party stats DO matter at these. The rest of the landscape is a brilliant mix of static painting and moving pieces. Obsidian, even more so than Larian or InExile (even though Divinity and Wasteland 2 both made Eternity possible), has brought back the CRPG hard. There have been Great Kickstarter Games before (most notably The Banner Saga), but Pillars of Eternity, no bull****, is the friggin' return of an endangered artform on the verge of extinction. I don't mean that in some hippy, warm-and-cuddly "old school gamer" way. I mean that in a very real and tangible way, with a form for the future of a medium that is in its last years of college and struggling to prepare for the real world. Edited by Bryy, 27 March 2015 - 09:01 PM. As far as the locked-out dialogue options are concerned, there is an option you can toggle in the game menu so that they do, in fact, never show up. It's still weird that is the default setting. Seems like it should be the other way around if there is a toggle for it. I switched off the dialog hints immediately. It's quite interesting to see the disposition I'm developing. It's a surprisingly even mix of things. I absolutely do not want to turn that into a minigame, so I'm really happy I have the option to have them off. Thanks for the review. Glad you are enjoying it. I play with the unqualified responses off like some of the other posters. I also play without the mini combat UI above each character and selection circles. I like to see my party. Hi Everyobdy out there! Hi Obsidian! German ratings from major and most important game testing magazines are online. I did hope for a rating for at least 85% but this... I can't believe it. It is so great!!! So this is absolutely amazing and I am missing words for this. The biggest THANK YOU TO OBSIDIAN! YOU GUYS MADE A D R E A M COME TRUE! Going further, I like the pre-existing party member dialogue, but the characters themselves just don't seem interesting or really like a part of your story. They seem more like ancedotes of the world rather than companions.